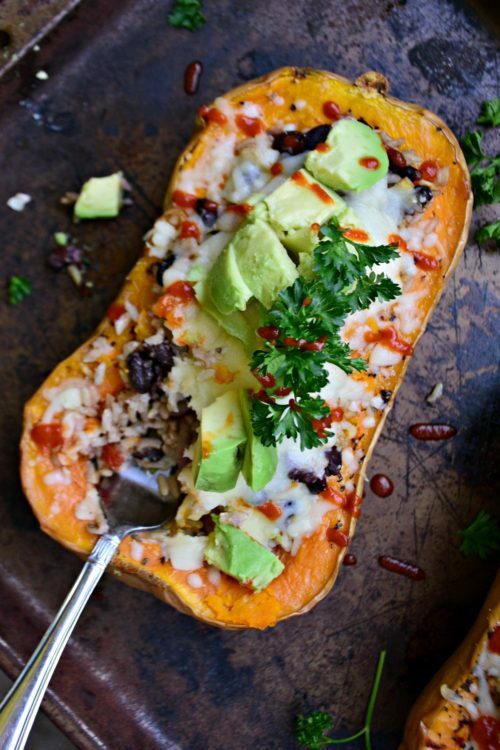 This Mexican rice stuffed butternut squash makes the ultimate Thanksgiving side dish! Plus, it’s beautiful to boot! 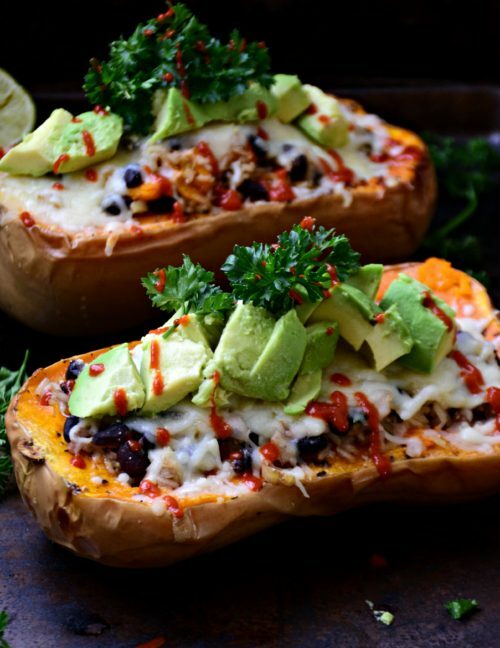 Stuffed squash is the new sweet potato casserole. At least in my book, only because I don’t like sweet potato casserole. At all. It’s squish mashed potatoes with cinnamon and topped with marshmallows. Marshmallows have one place they need to be, and that’s delicately smashed between two graham crackers and a giant piece of Hershey’s chocolate. I’ll tell you one place they don’t belong, ANYWHERE NEAR THANKSGIVING. I have some pretty aggressive feelings on sweet potato casserole, and I refuse to apologize for them. 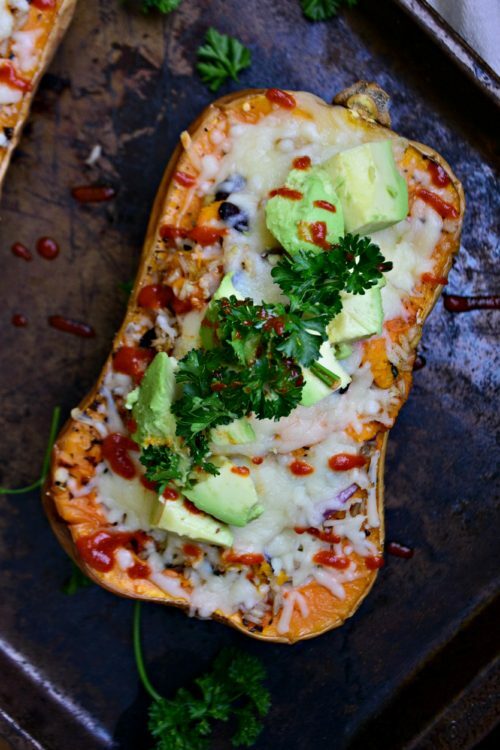 Moving on, though, let’s talk about this Mexican stuffed squash for a hot second. 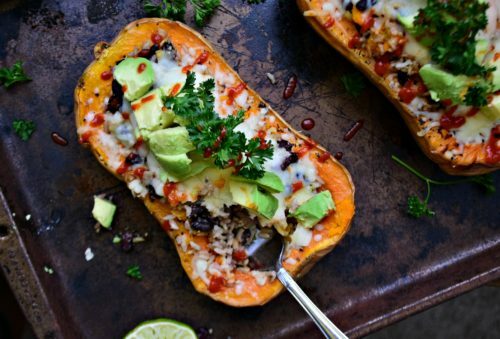 Stuffed squash is one side dish that’s guaranteed to please. For one, it’s beautiful. The vibrancy of the colors make it almost as pretty as a bouquet of of flowers. Except instead of dying, this squash gets devoured. Horray! This Thanksgiving is a little different than last years, because instead of going back to Cleveland to spend it with my family, I’m going to Chicago to spend it with my boyfriend’s family. Yep, we’re officially THAT official, although we might have hit that mark when we decided to put an offer in on a condo downtown. BUT, in my head, spending the holidays with a new boyfriend is kind of a big step. I’ve met his family plenty of times, and absolutely love them (we’re even Facebook friends). There’s just something, though, about spending the holidays when them. It’s intimate, a cherished time of year often reserved just for close friends and your close family members. Joining as the new girlfriend to the eldest son is a little bit daunting, to say the least. So, friends and fans, what would YOU bring to Thanksgiving dinner when you’re the new girlfriend? His mom and sisters are gluten-free, and I know they’re going to have desserts down pat. A side dish, maybe? Something simple, like this squash or these carrots? Or would you opt for something sexier? I’m a little nervous, which means I’ll bring a bottle of wine (that I’ll chug out of nerves), four side dishes and at least 3 bouquets of flowers. Seems normal, right? Preheat the oven to 400°F. Slice the squash in half and clean out the seeds. Separate the butter in half and place chunks over each half. Roast for about 40 – 45 minutes, or until fork tender. when squash is soft, use a spoon and remove the flesh. Either mash or cut into bite-size pieces. When the squash is roasting, make the rice by mixing the rice and two cups of vegetable broth in a medium size saucepan. Bring to a rapid boil and then reduce to a simmer. Cover and let cook for about 15 – 20 minutes, or until rice is fully cooked. Fluffy the rice with a fork and mix with the butternut squash, black beans, tomatoes, jalapeno pepper, red onion, garlic and 1/2 cup cheddar. Add salt and pepper to taste. Spoon the rice mixture into the squash halves and divide evenly. Sprinkle with mozzarella cheese and bake until everything is heated and cheese is melted, about 8 – 12 minutes. 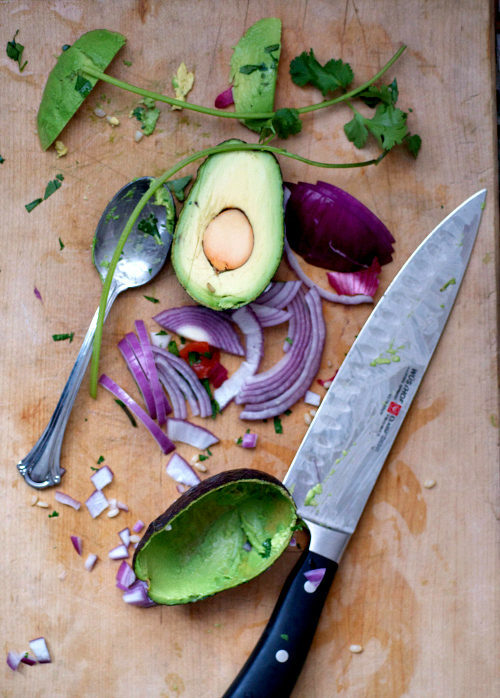 Garnish with avocado and chopped greenery.